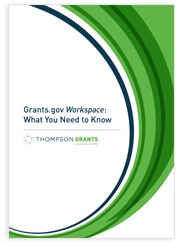 As of December 31, 2017, Grants.gov will retire the traditional application package download process and require all users to submit applications for funding via Grants.gov Workspace. Are you ready to make the switch? Thompson Grants has put together this short tutorial to offer insight into what you need to know and do to make this transition painless.